Indian mythology is full of miracles, supernatural and marvelous phenomenon, which cannot be justified with the common knowledge of Science. But every tale (not almost but every) has something or the other to teach us. The teachings mostly being about moral and ethics, what is righteous and what is wrong. In short how to behave as a human being. Indian mythology is overwhelmingly full of such tales and incidents. One of such incident is of Sant Jñāneshwar. contribution to Marathi literature and overall history of India is something inexplicable. 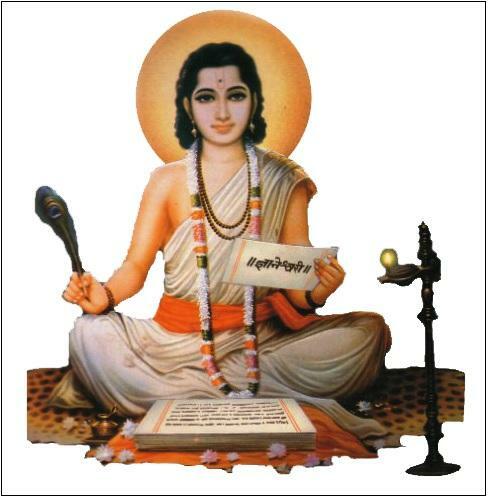 He wrote a commentary and critic on Bhagvad Geeta, known as Bhavartha Deepika, at the tender age of 15. Today, that Bhavartha Deepika also known as Dnyaneshwari is considered a milestone in Literature World. He had one elder brother (Nivrutti – who was also his Guru/teacher) and 2 younger siblings (Sopan and Mukta). Now he (Dnyaneshwar) being very pious, soft spoken, ever calm and composed, often did some or the other miracles like, asking a male buffalo to read out the Vedas loudly and cooking bread on his sister’s back etc. But the most talked about miracle is of he and his siblings sitting on a wall and making it fly. The story may be true, may not be true. I, however, believe that the story is true. But keeping aside the practical part of it, we have a huge lesson to be learnt from this incidence. It often happens that we get into the fight of deciding whether it is correct or not and always keep aside what we need to learn from it. Coming back to the story, there was another learned person and a saint himself named Changdeva Maharaj, who was a mystical yogi. He had control over the “Classical Elements” and used to perform supernatural acts with his this control. It so happened, that Changdeva Maharaj came to know about Dnyaneshwar and his sibling’s prowess over Vedas and wanted to test them. So he sent a blank note/paper to Dnyaneshwar Maharaj. On receiving this blank paper, Dnyaneshwar Maharaj and his siblings started laughing at this gesture and wrote back a 65 verse quintessence on Vedas back to Changdeva Maharaj. Changdeva Maharaj, though being highly learned and so much powerful, couldn’t understand anything out of those 65 verses and decided to meet these children in person and show the greatness and power of his. So he rode a huge tiger and carried a venomous Cobra as a whip. Dnyaneshwar saw a big procession coming towards their village and spotted Changdeva Maharaj riding a tiger. These siblings then sat on a wall and made it fly towards Changdeva Maharaj. Changdeva Maharaj was stunned to see an inanimate wall being used as a vehicle. His false pride and ego was crashed in an instance and he suddenly alighted from the tiger, sat on his knees to salute Sant Dnyaneshwar. He then became one of the disciples of Sant Dnyaneshwar. Just because you are older than others, doesn’t mean you are of higher stature. (Dnyaneshwar was just 12-13 years of age and Changdev Maharaj was more than 50 years when this incident took place.) As we know, capabilities bring more responsibilities. The more learned you are the less should be your ego and false pride. Rather, a learned person should never have an ego. Changdeva had so much power, but he had ego, and that was the worst part of it. Ego kills the knowledge you have. Too much boasting on knowing something is very harmful. You are not the only one who knows things; there will always be someone else who knows more than you. If we have to take recent example, we can think of Sachin Tendulkar. Even after spending 23 years in the game of cricket, he is not complacent about his batting and playing prowess. it’not his sister’s back,it’s his own(self) back, due to he caught by very hot fever.